AFTER OBLIVION is a young tech death/thrash metal band hailing from Bosnia and Herzegovina, but they surely know how to write songs and play on the world class level. The band deliberately embraces Chuck Schuldiner's legacy. Not only their music sounds like late-era DEATH, with flowing, often Middle Eastern flavored riffs and leads creating beautiful soundscapes, but also the vocals bear uncanny resemblance to Chuck's voice. It's technical (but not overly technical or progressive - on contrary, quite catchy, so accessible for a wider audience) and atmospheric classic death metal with some intense thrash elements. An excellently crafted, mature debut that should appeal not only to all fans of DEATH, but also PESTILENCE, ATHEIST, KREATOR, SACRIFICE, VEKTOR, GORGUTS, AGONIZE, CYNIC or CORONER. Risen from the ashes of PATH BEYOND SERENITY (an oriental flavored melodic death metal band formed in 1999) from Tuzla in Bosnia and Herzegovina, AFTER OBLIVION came to life in 2007. Eastern melodies were ditched for a more intense and sharp sound, still very resolutely rooted in traditional death metal, a genre often perceived as destined into oblivion. And "Death" is the keyword here, with the band deliberately embracing Schuldiner’s legacy, especially his latest works, and using it as a platform to build its own sound. Shortly into the band’s existence, Adnan Hatić (AGONIZE), the driving force behind AFTER OBLIVION and the sole member at the time, managed to record a debut four track demo entitled "The Carnal Form", which was soon re-released via Hidden Throne promotions as a split with Brazilian band No Blest in 2007. "The Carnal Form" stand out points came in form of Adnan’s signature highly energetic rhythm work and it became evident that he has found his comfort zone with the high pitched growls. In 2009 the next logical step was to gather a full line-up, so Marko Gačnik (drums) and Jasenko Džipa (guitars), both from brutal death metal band FESTIVAL OF MUTILATION, joined AFTER OBLIVION. Bass duties were taken over by Dario Stevanović (formerly of AGONIZE), which enabled the band to perform live and bring their brand of death metal to a wider audience, including a few DEATH tribute shows. Those shows brought perfect band chemistry among the members and as a result they recorded eight tracks in 2010, three of which were chosen to be released as "Vultures" EP in March 2011. "Vultures" showed improvement on all fronts, from the thicker sound to a more creative guitar work - songs with more identity and for once production which does justice to the very serious and honest musical approach of this up and coming band. This effort was appreciated by the press and fans worldwide: the EP garnered many enthusiastic reviews. The band also produced a video clip for song "Septic Mind", which received great reactions as well. In 2012 the hard work started to pay off. AFTER OBLIVION contacted Metal On Metal Records which, highly impressed by the band's skills, offered them a deal. Still before the contract was signed Haris Hasančević (AGONIZE, ex-PERISHMENT) replaced Dario on bass. 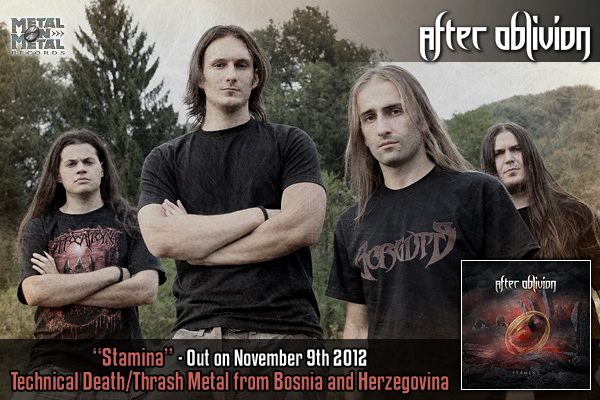 The debut full-length album "Stamina" will be released on November 9th 2012. Expect a real tech death/thrash feast that is not only a homage to the '90s period of DEATH, but bears also a personal stamp. AFTER OBLIVION play with technical virtuosity, but it's not the main focus of the band. Their songs have a classic feel, solos are full of emotion and have a human factor, as opposed to being a mere show off of the skills with odd, off-beat scales, syncopated rhythms and dissonant chords/riffs, so common for many tech and prog death metal bands. "Stamina" is old school, atmospheric and intense.